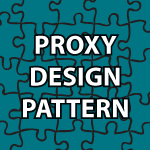 Welcome to my Proxy Design Pattern Tutorial! The Proxy design pattern limits access to just the methods you want made accessible in another class. It can be used for security reasons, because an Object is intensive to create, or is accessed from a remote location. You can think of it as a gate keeper that blocks access to another Object. I demonstrate how the proxy pattern works using some code used in my State Design Pattern Tutorial. You may want to check that tutorial out before proceeding. The best place on the internet that I found to teach you Design Patterns. Thanks for providing the best ever tutorial on design patterns. Do you have something in Java concurrency also? Excellent site to learn Design Pattern.THanks a ton for your effort. Request you to kindly add some tutorials for Java Concurrency. these video lectures helped me a lot. Nice tutorials, but you forget to include “ATMState.java” code. The code you provided here is incomplete. There are a lot of staff missing here, including some classes from your “State Design Pattern” code, where some classes should be refactored to suit “Proxy Design Pattern” needs. I have seen almost all of your videos about design patterns. This help me a lot in polishing my java skills. And yes Of’cousre You have the Most innovative method of teaching. God Bless You. Keep Rocking !! Thank you very much 🙂 I did my best to teach in a new way and I’m glad that it seems to help some people. May God bless you as well. Very well explained. Is there any way we can get access to the slide and UML diagram shown at the beginning of the video? This goes for all videos on design patterns. Thank you so much for sharing the link. Really appreciate it. I have a confusion. Does the methods in Proxy not return initial states of a fresh object all the time? Since, it is freshly allocated there and returned. Awesome example and great explanation. Hats off to you for such nice tutorials on design patterns. Thank you so much. Please keep up the good work. God bless you. Thank you very much 🙂 May God bless you and your loved ones as well.